Your microbladed brows will darken over the first 4 days, after which they will start to peel. You must not pick at your brows during this time. During the first 10 days, they will be changing in appearance due to the healing process. If you have the time to wash your face and only come in with your brow makeup done, this is ideal. Wearing a headband or ponytail is helpful, too. No alcohol, Tylenol, or Advil for 48 hours prior to your treatment as these can thin your blood. We recommend that you plan to take time to relax at home after your appointment. If you have an autoimmune disorder, please consult your doctor prior to scheduling your treatment with us. 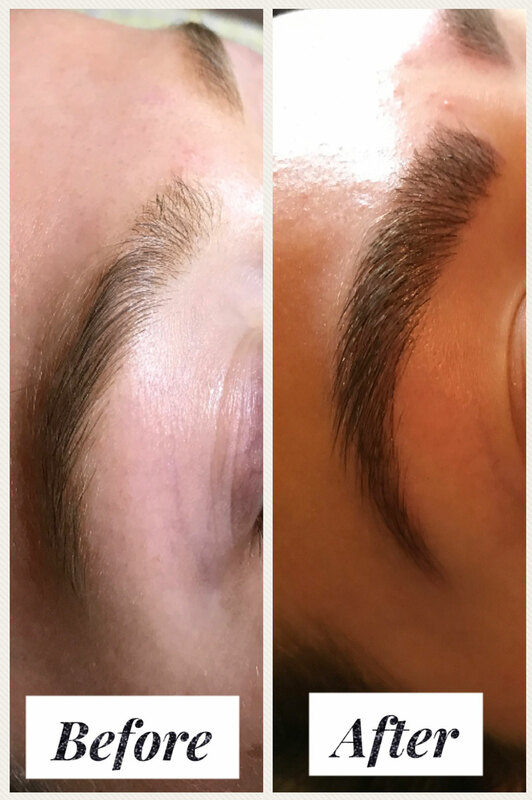 We cannot perform any microblading on you if you are pregnant, diabetic, are prone to keloid scars, or are on any blood-thinning medications. The first day after your treatment, your brows will be a somewhat tender and about 40% darker than the final result. Please do not touch them at this time! Keep your brows clean and use our sweet almond oil to protect them. Aquaphor ointment can be used before showering to protect your brows from too much water exposure. Please purchase a tube of this from any drug store prior to your appointment. You may ice the brow area after your treatment or the next day if you feel it’s necessary. Please make sure the ice is in a clean baggie and do not reuse. For the first 7-14 days, you will need to avoid excessive sweating or heavy workouts. Do not put anything on your brows except for the sweet almond oil & ointment. Absolutely no sun exposure during this time! You will need to stay out of the sun or wear a hat to protect your exposed brows. Treat it like a wound: Think clean, clean, clean! A gentle water rinse is okay 1x a day after the first 12 hours but please keep in mind that excess water is not good for the pigment. After 30 days your brows will be done with the healing process. You will have a better feel of how they look at that point. You may use your SPF & makeup on the area after those first 30 days. No acne / anti-aging products on the brow as it can fade or change the color of the pigment. Glycolic, benzoyl peroxide, salicylic acid, and retinol / retin-A should never be used on your microbladed brows. Please be mindful when you are using your products.